I must admit, I am definitely one for cosying up in my comfort zone. My weeks and weekends are generally quite hectic, and juggling a busy work / life schedule doesn't often lend itself to trying different things - I just don't have the time. Furthermore, I am not much of an outdoorsy person either - My love of interiors I guess rings true with the fact that generally I prefer being snuggled up indoors than being outside! Not to say I don't like being outdoors, especially at this time of year, but I'm just not big on camping and you know, generally outdoorsy things like that. So, last weekend I decided it was time to step up and step outside and challenge myself to something a little different. I spent my Saturday in the woods with the guys from Miscellaneous Adventures - husband and wife team, Andrew and Emma - who host creative workshops in the great British countryside. Ok, so the workshop I opted for was a little less 'physical' than some of their others, but still, it was change of environment for me nonetheless! Their main workshops are wood carving and axe skills, but I was taking their newest course - Drawn to Nature. The group of seven gathered around a small camp fire, with cups of steaming tea and coffee, while we were introduced to our teacher for the day - Esther McManus. We were encouraged to slow down, investigate our surroundings and find what interested us personally, before we set off on foot for a series of drawing exercises. It was the drawing element of the workshop that drew me to it (scuse the pun!) in the first place. I used to love drawing and painting back when I was at art college in the late 90's (blimey that makes me sound old!) - but as I'd specialised in photography for my degree, I literally hadn't picked up a sketchpad in years, and I really fancied giving it another go, and just being offline for a day. Esther's instruction was inspiring and fun, and was interspersed by factual nuggets from Andrew about the flora and fauna we were discovering, his knowledge about the woodland clearly rich and informed. The surroundings were immensely epic and the light on the day was truly beautiful, I struggled to stick to drawing as I was often tempted to snap away with my camera! As you can see my drawing and painting skills need a little bit more refining, but for me that wasn't what the day was all about. It was simply about going outside that comfort zone I'm usually so snuggly wrapped in, and discovering that sometimes doing something different is all that was needed to invigorate your soul. 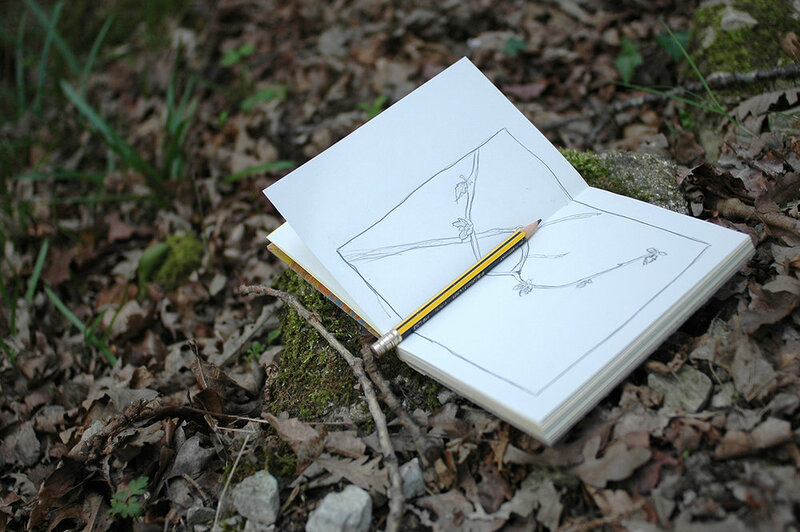 Find out more about Miscellaneous Adventures on their website - they plan to run more Drawn to Nature workshops later this year, so if you fancy it, it''s probably worth signing up to their newsletter.